Barcode and RFID tags help keep track of inventory, reduce errors, and increase efficiency. Use automatic replenishment to maintain inventory levels and ensure orders are never late. Inventory lot control protects your stock from expiring before it is purchased. Group items that are commonly sold together to increase production efficiency. Easily keep track of historical product information with serial numbers. Handle returns, repairs, and exchanges with ease by using return material authorization to track items. We provide complete invoices and bills that can be customized to fit your organizational needs. Run comparisons, create graphs, and generate detailed analyses with reports and analytics. Re-gain complete control over your consignment stock that is stored at customer locations. 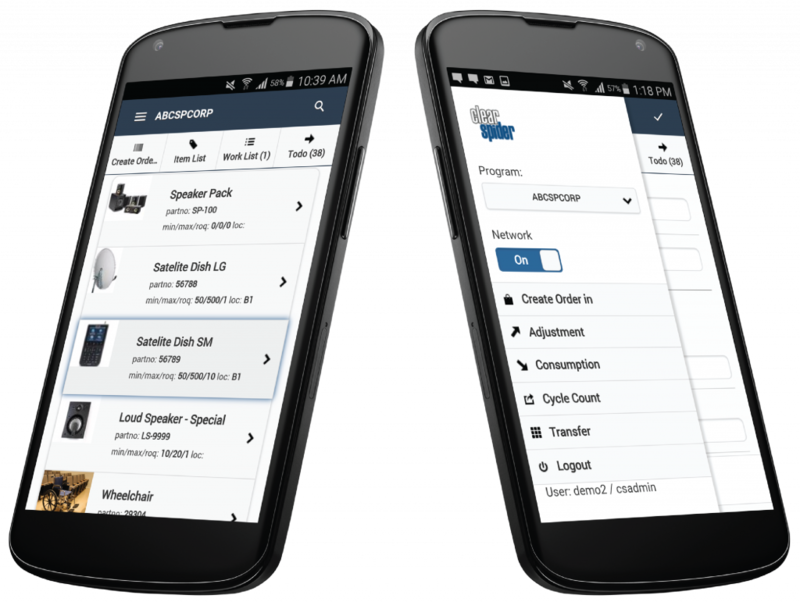 Improve inventory accuracy and task efficiency with real-time inventory management on-the-go. Use your smartphone camera to scan items for efficient data entry and other transactions. Continue to work on the mobile app even when there is no network connection. Complete transactions, and access inventory information from anywhere at anytime. Our system was designed with the user in mind to make implementation and usage simple. Clear Spider is a highly flexible system that can integrate with any enterprise software on the cloud. Have a seamless flow of information even with multiple software applications in place. Clear Spider is a cloud-based solution that gives clients access to real-time information from any location worldwide. Users only need an internet connection to access the system. We provide clients with a system that mirrors their inventory workflow to improve overall efficiency. Our system helps clients overcome complex and unique inventory challenges. Our system was designed with a user-centric focus to make navigation simple. We also allow our clients to add or subtract funcationality based on need to optimize efficiency. We know that data security is critical to your success. That’s why we offer the same standard as internet banking and around-the-clock hosted protection to keep your data secure. Implementation is done on the cloud from a remote location with no hardware or software installation. As soon as the system is set up and tested, it is ready for use.